Iris bog plants are the most popular among bog plants for water gardens. They form a beautiful backdrop for any pond with their foliage and variety of flowers. They also form part of the natural ecosystem of a water garden by serving as natural filters to the areas in which they are planted. Some Irises, like the Louisiana Iris can be planted in wet soil or individual containers. 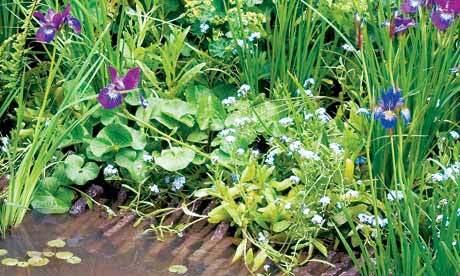 As other bog plants, they should be planted in shallow water just a few inches deep. Other kinds of Irises, like the Iris pseudacorus, should be grown in a container first and then planted to the soil. Therefore, be sure to know what are the requirements for the particular Iris you wish to plant in your water garden. Irises are generall low maintenance plants, but should be cut back and thinned every other year so decaying leaves do not accumulate excessively.